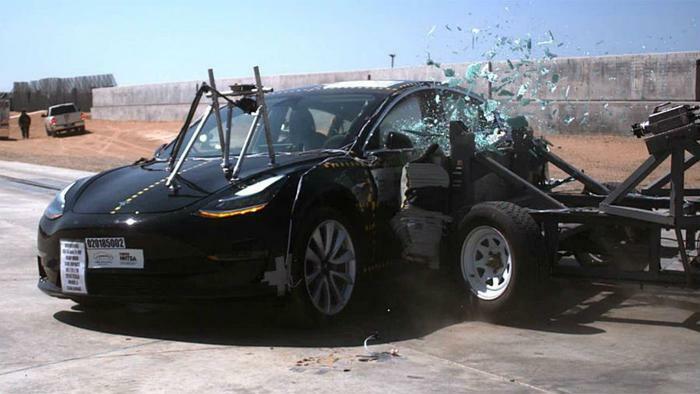 Tesla’s entry-level Model 3 electric sedan has received a five-star crash test safety rating across the board from the National Highway Traffic Safety Administration (NHTSA). The rear-wheel drive version of the vehicle earned the agency’s highest rating following several tests. In the first, it was launched against a fixed barrier to simulate a head-on collision at 35 mph. The car successfully protected the front occupants. Its side impact protection was tested by way of simulation where it was thrown against a side barrier at 38 mph. The vehicle held up well and was able to protect the front and rear occupants. For the last test, the NHTSA rolled the vehicle over and was again impressed. Some of the car’s driver assistance features -- such as forward collision warning, lane departure warning, crash imminent braking, and dynamic brake support -- also tested well, although they were not used during the crash tests. While the vehicle fared well in performance tests, the agency didn’t evaluate the automaker’s controversial Autopilot feature. The feature, which has been involved in several high-profile crashes, has elicited criticism from consumer groups who argue that Tesla markets the feature in a way that oversells the technology and misleads consumers. The NHTSA is still investigating whether Autopilot was to blame for a crash that occurred in May where the driver broke her ankle. The agency previously determined that Autopilot was not to blame for a crash that resulted in the death of Joshua Brown, which occurred in July of 2016. However, the National Transportation Safety Board disagreed, arguing that Tesla had not considered the “human element” of its technology. Tesla’s previous cars have also earned perfect ratings from the federal agency. In 2017, the Model X SUV received five stars in all categories and subcategories. Back in 2013, the automaker’s Model S earned a rating of 5.4 stars. The NHTSA is one of two main institutions that administer crash test ratings in the US. The Insurance Institute for Highway Safety (IIHS), which is typically more stringent, hasn’t yet published its crash test safety results for the vehicle.